Beautykinguk: Davidoff Cool Water Game! When it comes to aftershaves I have a large and rather varied collection, some come and go without ever being replaced whilst a few firm favourites are bought well in advance of them actually running out. Never being one to stay with just one brand I am obsessed with trying new fragrances and it was whilst out shopping I tried the tester to Davidoff Game. The tester had me instantly hooked due to the slap in the face refreshing citrus aroma and relatively bargain price. Being a fan of the Davidoff Cool Water and Cool Water Deep range I had no hesitation in purchasing the full gift pack for £45, which included a 100ml bottle of the aftershave, moisturising lotion and shower gel. £45 may seem excessive but readers should bear in mind that 100ml of this aftershave (taking the other items in the pack out of the equation) will last for well over 9 months when being used on a daily basis and if purchased individually the price comes down to only £35 on the high street. Alternatively it can be purchased from several reputable online aftershave retailers with prices as low as £25. 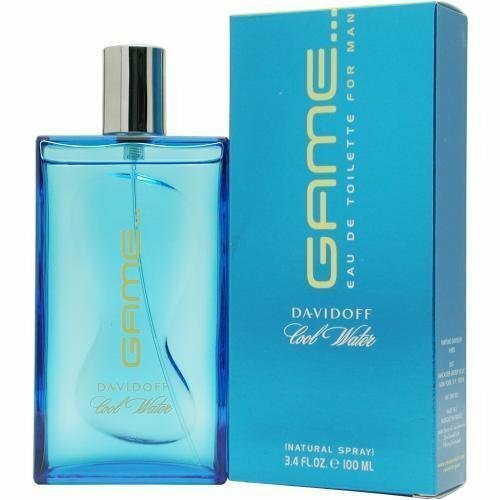 The bottle to Davidoff Game is blue in colour, as are most of the aftershaves in the Davidoff range and totally unique in style. Made from thick glass the bottle is fairly heavy at first. The sunken sections of the glass makes it very easy to hold onto even with wet hands removing the risk of injury should you accidentally let it slip from your grasp in the bathroom. The actual amount of thought that has gone into bottle design isn't surprising, it is something of a Davidoff trait with all of their aftershaves having very novel bottle designs, the funkiest that springs to mind is Davidoff Echo, a great bottle but absolutely vile aftershave. Before going any further I will explain the differences between head, heart and base. The head note ingredients are usually the first ingredients you will smell in an aftershave or perfume. In light a fruity fragrances these tend to be citrus fruits or plant extracts. The heart notes provide the deeper body to the fragrance and usually consist of tobacco, berry extracts and milder spices while the base notes provide the long lasting fragrance when combined with the head and heart notes. Head: Grapefruit, watermelon and bail verbena leaves. Heart: Green Blackcurrant, gingko and lavender. Base: Cedar wood, patchouli and musk. The marketing blurb to the aftershave (which I have to say is incredibly accurate) sells Davidoff Game as an aftershave that has notes that will spark you to life with fruity bursts of citrus that will contrast with underlying notes to produce a refreshing yet warm sensual masculine fragrance. My own personal experience has actually been summed up in a rather brief manner by the Davidoff marketing department, but it doesn't give the full picture of how this aftershave changes over time, something it almost definitely does over the day. As I have said, I was drawn to the aftershave when out shopping - it was an impulse buy so I bought it based upon the top notes and before actually trying it on myself over a full day. The last time I did this I ended up with the lemon that is Davidoff Echo so I was eager to try it. Only 3 gentle squirts of the atomiser release enough of the aftershave to cover the face and neck and my first impressions were that I had fallen into a fruit salad. The grapefruit and watermelon are instantly noticeable and provide a very strong and refreshing assault on the senses. The grapefruit provides the zesty citrus aroma that seems to linger yet as it blends on the skin the most evident fragrance is that of watermelon and this remains for around 30 minutes as it is absorbed into the skin. The heart and base notes begin to become the dominant ingredients changing it from a light airy fairy aftershave into something deeper, warmer and far more masculine than I expected when I first tested it. This is not to say it is a bad thing, in fact I was actually surprised by how much I liked the fragrance after it had dried down. It is rare that I personally like aftershaves that become heavier and warmer over time; Davidoff Game is one of the exceptions to the rule. As the watermelon fades so does the citrus vibe to the entire aftershave, the heart note of lavender then becomes most pronounced and as this blends with the cedar wood and patchouli it is as though the nostrils are taking in warm air. The fragrance becomes almost floral with hints of a spicy wooden undertone and this is how it remains for hour after hour. Most aftershaves last around 10 hours, Davidoff Game can still be smelt 20 hours later its staying power is that good. While it does fade eventually I personally can't argue with an aftershave that I really like that is affordable, long lasting and has the ability to remain lovely late into the evening after applying first thing in the morning. After wearing Davidoff Game on and off for years I have to say it is one of those inoffensive fragrances that will have something for everyone. Those who enjoy their light, refreshing citrus fragrances will love the initial blast of watermelon while those who prefer their rugged masculine fragrances will be impressed with the dry down aroma. I wear Davidoff Game around the office and when hanging around the house at the weekends. I love the women's version of this but have never smelt the men's. It sounds nice! I've never had this one ... I've had Cool Water which is a nice one! Need some new ones really! This is a really in-depth review, the scent sounds lovely. Here's a great online resource for Davidoff Cool Water, and free shipping too!